School may be out, but books are always in. Hawaii residents are lucky to participate in two long-time summer reading programs. For readers of all ages, the Hawaii Public Libraries is sponsoring a summer reading program from June 4 to July 15, 2017 for children, teens, and adults. For the first time readers can register online using Beanstack, where you can earn badges and set reading goals. This year’s theme is “Build a Better World” Each library has different activities and prizes, but you need a valid library card to participate. During the 2014 summer reading program the most recent library data I could find, 29,847 participants read 358,660 books. Wouldn’t it be amazing if 100,000 readers signed up this year? In addition to reading books, you can also support your local library by volunteering with the Friends of the Library of Hawaii. Help out during the summer reading program and throughout the year – such as shelving books, selling used books, counting visitors, or donning a costume to delight the kids. Contact your local branch to ask how you can help build a better local library. Students in grades 1-6 can also join the Barnes and Noble summer reading program, from May 16 to September 5, 2017. Students can read any eight books this summer and record them in the Summer Reading Journal, along with a note about your favorite part, and you can earn a FREE book from the book list on the back of the journal. There are two Barnes and Noble stores in Hawaii, in Honolulu, Oahu and Lahaina, Maui. Mahalo to Hawaii Public Libraries and Barnes and Noble, for encouraging readers, discovery, and imagination. What books will you read this summer? What does building a better world mean to you? 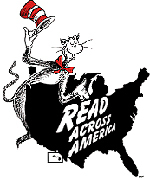 Read Across America is one of my favorite reading celebrations. It’s entertaining and creative and a little wacky. My son has done fun projects, from decorating a “Cat in the Hat” hat in preschool to reading about the real life of Theodor Seuss Geisel. “I admire Dr. Seuss because he made the Grinch and the Grinch is funny,” he wrote when he was in the third grade. 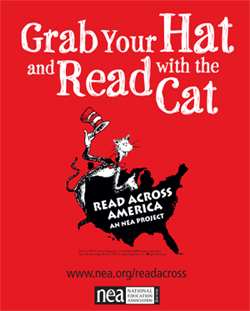 In the free downloadable “Read Across America 2016 Classroom Activity Guide,” you’ll find a lot of ideas and tips for celebrating reading, pets, and imagination. * Read to your pet. Build your speaking confidence by reading out loud to your dog, cat, or favorite stuffed animal. Pets enjoy the sound of your voice and you’ll have a devoted audience. * Tell animal tails. Write a story from your pet’s point of view. Include animal facts and experiences with your own pets. * Imagine a perfect pet. Create a new fantastic pet of your own. Describe its size, shape, attributes, personality, behavior, and appetites, and then write a how-to guide for caring for this special pet. * Draw pet portraits. Using a photograph of a pet or animal, draw a pet portrait with Dr. Seuss’ whimsical style. * Help animals in need. Support your local animal shelter by hosting a “Read for the Animals Read-a-thon” or creating artwork as a fundraiser. You could even make a class booklet about caring for pets and being a responsible pet owner. And before you put your book in a nook… give your book a special look! Check out Avery’s free printable Reading Awareness labels and bookplates for your books. Dr. Seuss declared, “You’re never too old, too wacky, too wild, to pick up a book and read with a child.” What will you read today? And where? And why? I was not surprised to recognize myself in the pages of “Reading in the Wild: The Book Whisperer’s Keys to Cultivating Lifelong Reading Habits” (2014) by elementary school teacher and author Donalyn Miller, with reading teacher Susan Kelley. I love to read; but aside from reading to my son and buying or borrowing books for him, I haven’t really thought about how I could teach him to love reading too. 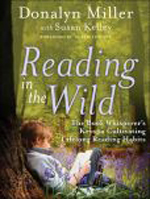 “Reading in the Wild” shows me how we can help children love reading, by pinpointing five characteristics of “wild” readers – people who love to read – and showing us habits that encourage reading. Written for teachers, it is based on the belief that “teaching our students to be wild readers is not only possible; it is our ethical responsibility as reading teachers and lifelong readers” (page xxiv). The authors cite research that shows that children who are readers are more successful in school; have greater opportunities in life; are more likely to succeed in the workforce; and are more likely to vote in elections, volunteer for charities, and support the arts. Students would probably not be persuaded by these arguments – but principals, school districts, and donors might be. 2. Wild readers self-select reading material. Set aside time to read aloud in the classroom – this creates shared experiences, exposes students to new authors and genres, supports developing readers, and makes reading enjoyable. Create book buzz about new books by presenting book commercials, reading an excerpt, and/or holding “book drawings” for who gets to read popular books first. Start a “Books to Read” list. Keep a “Reader’s Notebook” with title, author, genre, start and end date, and star rating. 3. Wild readers hare books and reading with other readers. Add book recommendations and home reading tips in school newsletters and on class websites. Create a bulletin board with “I am currently reading…” signs in classrooms. Host a book swap or book drive. Ask students to present “book commercials” about their favorite books. 4. Wild readers have reading plans. Commit to reading with challenge plans such as reading a certain number of books, reading books you never finished, or reading an entire series. Keep a “Books to Read” list. Write down reading plans and check out books. 5. Wild readers show preferences for genres, authors, and topics. Add more nonfiction to book talks and read nonfiction texts aloud. Read at least one book in different genres. “Reading in the Wild” is easy to read, practical, and inspiring. Though most teachers are not dedicated reading teachers, there are useful tips for incorporating and encouraging reading in daily and weekly lessons. I already use some of these strategies at home with my 8-year old son. There’s a helpful appendix with reading worksheets, surveys, and a list of students’ favorite titles and series. I am a wild reader. Are you a wild reader too? “You’re never too old, too wacky, too wild, to pick up a book and read with a child,” as Dr. Seuss said. 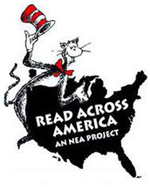 The National Education Association (NEA) celebrates Read Across America Day each year on or near March 2, the birthday of Dr. Seuss, to commemorate reading, learning and community. This year, the theme is “green” and showcases the Lorax books and protecting the environment. 1. Pledge to read. Join others at Read Across America who pledged to build a nation of readers, watch videos, and share your celebration ideas and photos. 2. Read to a child. Read with a child. The National Education Association has printable activities, stickers, and certificates; tips about planning a reading event; and booklists. 3. Read for your school. From February 14 to March 14, 2012, or until 150,000 books are read, We Give Books is giving away to public elementary schools across America. Each school that has 50 or more books read online on its behalf during Read for My School will be eligible to earn up to 500 free books! 4. Send an e-card to a reader. Motive others to read by sending a free e-card from Reading Rockets, created by award-winning children’s book illustrators. 5. Take a child to storytime. On Saturday, February 25 at 9 am, Target has a free Dr. Seuss Storytime Reading of “The Lorax” with fun activities. Check your local library for more storytime events. 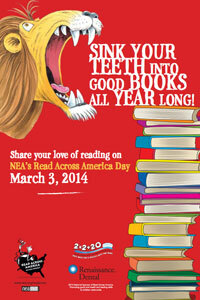 Let’s all make a special effort to read to our children on March 2 and every day! Since my son was a baby, we’ve read books to him every day. Now that he is in Kindergarten, learning to write and staring on phonics, I look forward to the time that we can read books together. 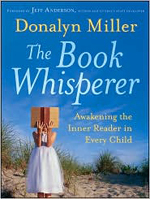 I was excited to read “The Book Whisperer: Awakening the Inner Reader in Every Child” (2009) by Donalyn Miller, which started as a blog by the same name on teachermagazine.org, hoping to learn tips and tricks to encourage my son to read. Miller is a sixth grade language arts and social studies teacher at Trinity Meadows Intermediate School in Keller, Texas. Miller begins with her journey as a teacher, from compulsively crafted reading units to reading workshops to book frenzies and the 40-book challenge. She focuses on making her students life-long readers, not book reports or tests. She is a champion of free-choice reading and independent writing. She shows teachers how we can create readers. “Students will read if we give them the books, the time, and the enthusiastic encouragement to do so” (page 177), Miller enthuses. I found myself nodding in agreement: Yes, that’s how I felt as a student, let me read what I want! Yes, I have a stack of to-be-read books! Yes, I jot down interesting book titles! Yes, I keep a reading journal! Filled with anecdotes, student quotes, interest surveys, and reading strategies, “The Book Whisperer” is personal, warm, conversational, and passionate about reading. There are practical tips for teachers and a helpful index with a guide to creating a classroom library (buy your own books — then you can take them with you! ), a recommended book list by students, and sample student surveys. 1. Challenge kids to read 40 books from various genres. It sets high expectations, ensures that they always have a book ready, and introduces them to a wide range of books. 2. Let kids choose their own books and share their past favorites. 3. Make time for independent reading every day – before school, waiting for the bus, and at home. 4. Let kids know that it’s okay to “cheat” by abandoning boring books, choosing short books, skipping pages, reading the end first, re-reading good books, and reading to escape. 5. Start reader’s notebooks, with reading lists, tally-lists, books-to-read lists, and response entries. 6. Be a role model. Show kids that you are enthusiastic about reading and share your love of books with them. 7. Read children’s books as an adult — it clues you in on popular culture, shows kids that you’re interested in them, and reveals their reading levels and interests. Remember that reading is its own reward. Take advantage of reading incentive programs, but the knowledge and understanding that kids can find in books are the real prizes. How can we encourage children to read? How can we become reading role models? 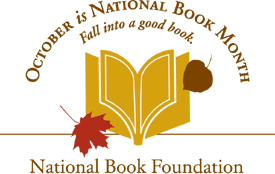 October is National Book Month, a celebration of good books, great authors, and enthusiastic readers. It’s probably not as well-known as Read Across America in March, but as an ardent reader, I’ll take any excuse to promote reading and talk about books. 1. Introduce literature into family game night. Try “Charades” or “Win, Lose, or Draw” with book titles! 2. Take family field trips to the local library. Everyone must check out at least one book. 3. Start a family reading night. Set aside one night to read and discuss a book. 4. Recreate scenes from your favorite book. Draw your own book covers or illustrate memorable scenes. 5. Read to your children every night. Set aside just 20 minutes a day, and before you know it, that’s 120 hours a year – five full days spent reading! 1. Start a classroom door art competition. Each class can decorate their door based on a book. Classrooms could win a pizza party or more books for the library. 2. Write letters to your favorite authors. The authors may even write back! 3. Launch a book swap meet. Students can bring in books they have already read and exchange them with books brought in by other students. 4. Have a reading recess. Convert one of the school recesses each day to independent reading time or impromptu book discussions. What are your favorite books? Do you share them with your family and friends? How will you celebrate National Book Month?